No word yet on Federal crash test results, though I guess since the Feds own the company now they can waive whatever requirements they wish. 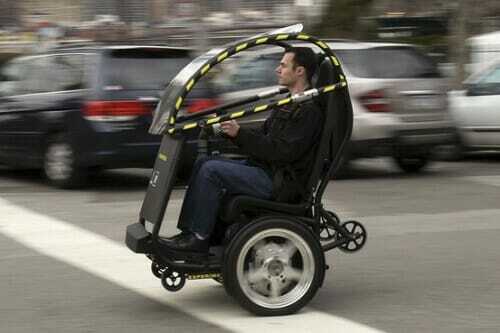 Postscript: Its probably a pretty cool technology, and I am sure it would be fun to scoot around in. But the company is hemorrhaging billions of dollars of cash a month and someone is still funding this? This can't be made in any of its plants, and can't reasonably be sold in any of its dealerships. GM would have to sell millions of these to have any kind of impact on its financials, and it is highly unlikely there is any such market. I therefore am waiting for someone in the Obama administration to say "this is exactly the type of thing GM should be doing." On NBC's morning show today, I saw a teaser for what had to be this (they didn't show a full view), so yes it's real. The goal is to have it essentially drive itself through city streets. And the cost would be 1/4 to 1/3 of a typical automobile. Assuming $5000-$10,000 for what is, in reality, a glorified scooter gives a price that will keep it firmly in the novelty class. Of course I am not a bureaucrat trained to discern the distinctions between successful and unsuccessful products, so what do I know? i would not be surprised to see them get around the impact standards by treating it like a motorcycle. it is, after all, a 2 wheeled vehicle. It looks like a motorized scooter that is advertised on daytime TV for medicare recipients who have a hard time getting around. How about some true innovation? A wheelchair with a windshield? When I first heard of this I thought "might be handy as a 2nd car that I use to for a really short commute or run to the store". But after seeing them I realized it wouldn't be very practical to use it to run to the grocery store w/ nothing to keep the eggs from falling off the passenger seat or that bag on the floor from falling over onto the street. And if my commute is really that small, I'd be just as well off riding my bike. I'd love to see how these things did in the snow. This probably only exists so that General Motors can "look good" to the Obama administration. After all, GM's major money-making endeavor right now is that of sponging off the taxpayer, and they largely do that by making friends in government by showing them stuff they think is cool. Isn't this just a Segway with a seat and a roll cage.